The Goldtera Motor Inn offers clean comfortable and Quiet rooms with a 3 and a half star rating (NRMA and AAA accredited). 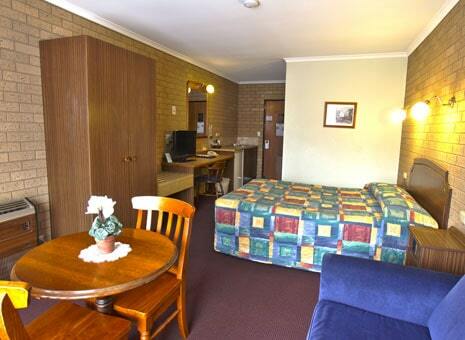 We are the closest Motel to the centre of town and across the street from the Temora Ex Services Club. Our BBQ and swimming pool area is a great spot to relax after a long drive or after a day’s work. While at our motel it is only a short drive to the Aviation Museum the Rural Museum and Lake Centenary. Our amenities include LCD TV with built in DVD, free Wi Fi ,microwaves, phone ,coffee and tea making facilities, fridge, toaster, electric jug, electric blankets, iron and ironing board, hair dryers, reverse cycle air conditioning. We have a guest laundry, Onsite parking for all rooms. For your convenience evening meals can be delivered to your room from the Ex Services Club. Hot or Continental Breakfast is delivered to your room. Mini bar in your room. Our motel has 12 rooms being 2x Family rooms 4x Twin rooms and 6x Double rooms.